The S&P 500 is once again close to a record high, as investors welcomed the withdrawal of Larry Summers from the race to become next chairman of the Federal Reserve. The blue chip index rose 0.6% Monday, ending just below the 1,700 mark. Earlier in the day, the broad index was just a handful of points below its all-time peak of 1,709 from the beginning of August. The Dow Jones industrial average rose 0.8%, while the Nasdaq ended in the red, as a drop in shares of Apple weighed on the tech-heavy index. Bond investors were elated too. The 10-year Treasury yield fell to 2.87% as investors rushed to buy long-term bonds. The dollar sold off against major currencies -- including the euro and the British pound. Investors are excited at the prospect of top contender Janet Yellen taking over from current Fed chairman Ben Bernanke, since she is widely expected to pursue a similar policy of stimulating the economy to bring the unemployment rate down. Yellen is currently the Fed's vice chair. 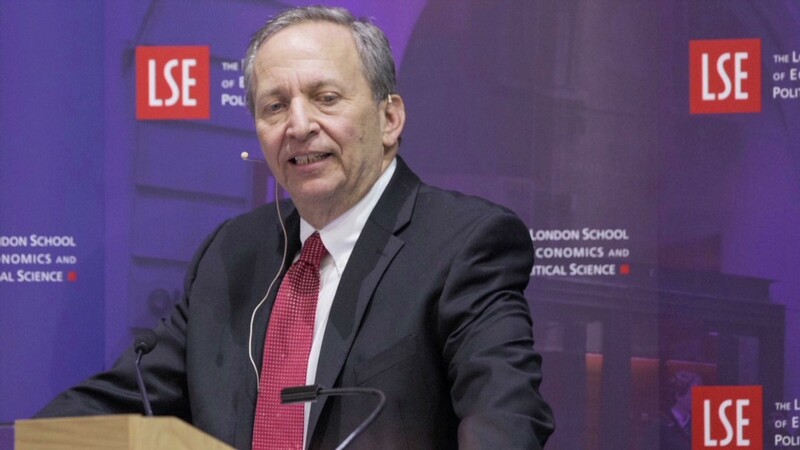 There had been some concerns that Summers, who was widely viewed as the frontrunner for the top Fed job, would have been more aggressive at pulling back on the monetary stimulus measures that have been pumping cash into the system and supporting stock markets around the world. "While Summers and Yellen are both doves who feel growth is a bigger risk than inflation, Yellen played a key part in designing the central bank's quantitative easing program and more recently, was a big advocate of forward guidance," said Kathy Lien, managing director at BK Asset Management. Lien added that Summers may have caused more volatility for the markets due to "his unpredictability and potential for unscripted comments." While the halt didn't disrupt broader market trading, it's yet another black eye for the exchanges. Saturday's announcement that the U.S. and Russia had created a framework to eliminate Syria's chemical weapons also lifted investors' mood. The threat of imminent U.S.-led military strikes against Syria has now faded to the background, but it had caused a significant amount of market volatility and spikes in oil prices. The price of light crude oil is now easing. The day's rally was broad, with nearly all ten sectors of the S&P 500 moving higher. Housing stocks were among the biggest winners, with shares of Pulte Group (PHM), DR Horton (DHI), and Lennar (LEN) all up sharply. Traders on StockTwits said investors may be betting on the group as Summers' decision to drop out from the Fed chief race could be good for the housing market. With Treasury yields falling, the hope is that mortgages rates might do the same. But even though the entire market was moving higher, Apple (AAPL) was a clear laggard. Shares tumbled more than 3% as investors continued to punish the stock after analysts were disappointed by the new iPhone 5S and iPhone 5C. Shares of Apple have declined more than 11% since the new iPhones were unveiled last week. BullGuy: $AAPL I hope they have a secret announcement for new iPads, IWatch, or itv, investors are not satisfied. 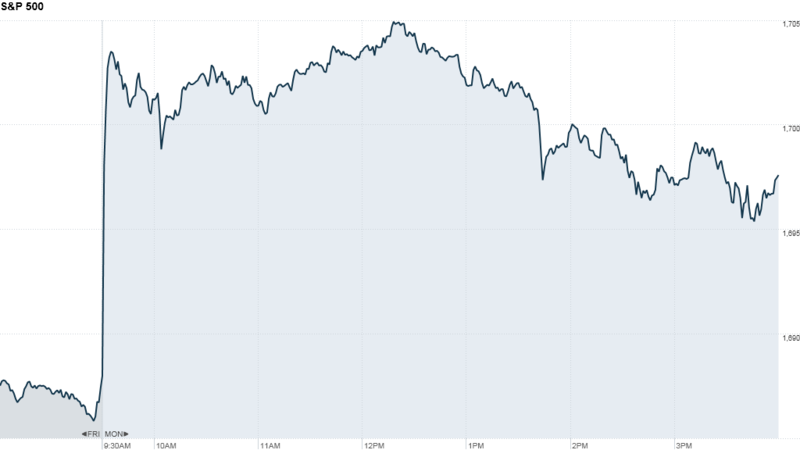 Facebook (FB) shares also ended sharply lower, dropping more than 4%. The stock hit an all-time high last week. On the economic front, manufacturing activity in New York unexpectedly slowed in September, according to report from the New York Federal Reserve. A separate report showed that industrial production rose the most in six months, although slightly slower pace than estimates, while capacity utilization grew in line with forecasts.